Now and then I am asked to play a gospel number at the funeral service of a family member of a close friend of the family. This is especially important to me if the person, who has passed on, is an old musician. I always think that a musician ought to be sent off with a piece of live music from some one who knew him or her. So it was that I was asked, by the widow, to perform a gospel number at the service of a cousin of mine. She had the tune all picked out. It was not one I was familiar with, but I looked it up on the net and set about to learn it. 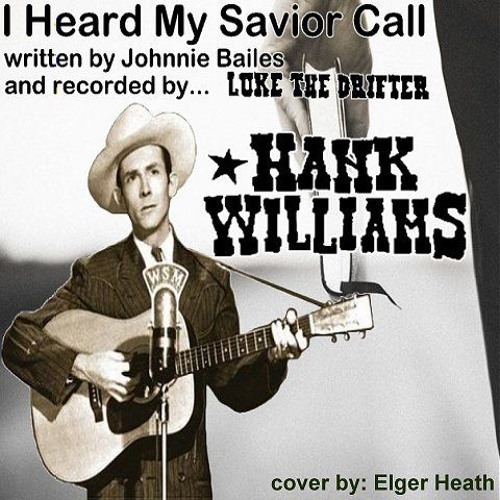 The tune was called 'I Heard My Savior Call' and was written by Johnnie Bailes. The musician I heard sing it was Hank Williams Sr.
My version is a little slower than Hank recorded it, but stays faithful to his style. Hank and I have a similar singing style. Likely I picked it up from him. Here is a single track recording of my cover of this tune as I learned it.